Coaches can earn their US Soccer Grassroots License by taking the online version of a specific playing format or attend an In-Person (recommended) version of a specific playing format 4v4, 7v7, 9v9, or 11v11 courses. All In-Person and On-Line courses are 4-hours in length. There is no formal assessment or prerequisite for the Grassroots License(s) and playing background is not a requirement for certification. *If you currently hold a USSF E-License, you can move directly on to the USSF D-License. If you do not currently hold a USSF E-License, the prerequisites to move on to the D-License are: Two In-Person Licenses + 1 online course. One of the two In-Person Licenses MUST be the Grassroots 11v11. US Soccer D-License - Prerequisite, GR 11v11 in person & 1-in person of your choice: 4v4, 7v7 or 9v9 GR License. Want to host a Development course in your community? 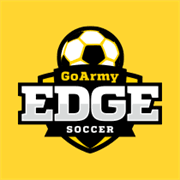 ​GoArmy Edge Soccer is a FREE game-changing app created by the U.S. Army that allows coaches to draw their plays on a digital whiteboard. The app allows players to visualize from the first person perspective or any position on the field with real-time 3D graphics. GoArmy Edge Soccer gives coaches the ability to organize their formations and plays into virtual coaching points to teach and test their players. GoArmy Edge Soccer comes pre-loaded with examples to help coaches get started. EFootball is a global soccer analysis platform where professional managers share all of their knowledge through sessions and training videos. Do not miss the opportunity to learn directly from the best.